Teach Your Young Child with Free Printable Flash CardsTeachers and parents alike try to find quality, easy-to-use educational materials to teach their students and children essential skills. When you're in preschool and Kindergarten, you learn many skills that will be the basis for a lifetime of learning. Whether it's the alphabet, numbers, or how to tie your shoes, your child will be using these skills for the rest of his life. It's important that you do everything you can to ensure these skills are mastered on time. When children fall behind early in their educational careers, it becomes more difficult to catch up with each passing year. Supplemental educational resources like those found in our free printable lessons can help you give your child the boost needed to not only meet expectations for learning, but exceed them. Check out the resources we have available! Free Printable Flash Cards to Commit Concepts to MemoryAt FreePrintable.com, we strive to make learning fun and enjoyable. Our free printable flashcards are colorfully designed and easy to read – perfect for youngsters! If you'll take a look at this category, you'll find a number of different flashcards, and there's more being added all the time. The most popular set is the alphabet flash card set, but our activities flash cards are popular as well. To use these flash cards, just print them right from our website or save them to your computer. You can use our print and customization tools to print them out one by one. Alternatively, you can save the files to your computer and use your own image editing software to print four to a sheet. Your child is going to love learning with these colorful and whimsical flash card designs. Learn the Alphabet with Free Printable Flash CardsThe ABCs may seem like a breeze to learn now that you're an adult, but if you have a great memory, you may remember how difficult it was as a child to remember what the letters look like and how they sound. That's why these free printable alphabet cards are so helpful! Let's start with the letter A flashcard. For the other letters, go back to the category link in the paragraph above this one. 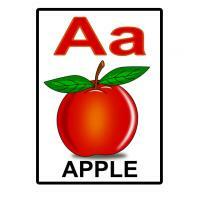 The letter A flashcard features a beautiful, brightly colored red apple. The letter is shown in both uppercase and lowercase, and the word "Apple" is spelled beneath the picture of the apple. It seems simple, but there are a number of powerful educational concepts at play here! Not only will your child learn the letter cases, but by showing a picture and a word, he will improve both his vocabulary and spelling skills. You can also use this as an opportunity to work on colors by asking questions like, "What color is the apple?" and "What color are the leaves?" Use the flash cards to make a game with rewards and prizes. Your child will love picking up his ABC flash cards daily.